Sayyeshaa Saigal may not have the best of debut as she dreamt to be. When she forayed into the film industry with Akhil Akkineni, she received brickbats from movie buffs and critics for her woeful performance. Her Bollywood entry 'Shivaay' also never got the desired response. But, Tamil Cinema welcomed her with both the hands and she made a huge impact on her debut movie and now she's a busy actress in the Tamil Film Industry. The actress is recently acting along with Arya for the Tamil remake of 'Bhale Bhale Magadivoy' and she attended an event along with the co-star. 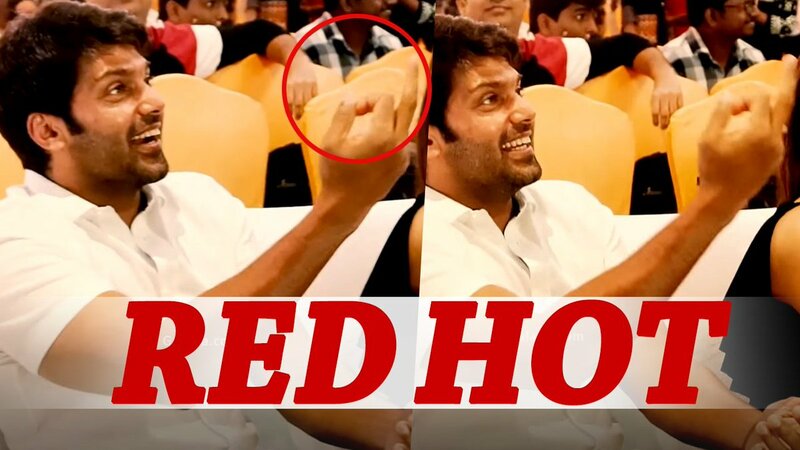 During the event, Arya playfully showed her the middle finger before everyone and there were laughs around. However, the cameras caught the right moment and the photos went viral across the Social media. The Tamil version is titled as 'Ghajinikanth'. Apart from this, Sayyeshaa also has 'Junga' under her kitty where she pairs with Vijay Sethupathi for the first time.